Palladium is the largest shopping mall in central Prague. It is on Republic Square (Namesti Republiky), opposite Municipal House, just a few minutes walk from the Old Town Square and Wenceslas Square. Palladium is an ultra-modern, multi-level shopping centre containing 200 shops, cafés, cashpoints (ATMs), a pharmacy, and health and beauty and fast food outlets. 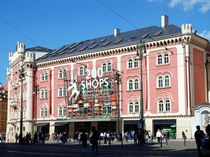 International stores include Body Shop, Calvin Klein, Esprit, Estée Lauder, EURONICS electricals, Guess, H&M, Lush, Marks & Spencer, Orsay, Promod and other well-known brands. Although Palladium is very 21st century on the inside, from the outside it is chateau like in appearance. The complex was built on the site of an 18th century building, and the façade was maintained. Below ground level is an Albert supermarket and a public car park which is open 24 hours, 7 days a week. Price: 50 CZK per hour or 700 CZK per day. Around Christmas, Easter and over other festive periods, wooden market huts are erected in front of Palladium selling hand-crafted goods and local food and drink.